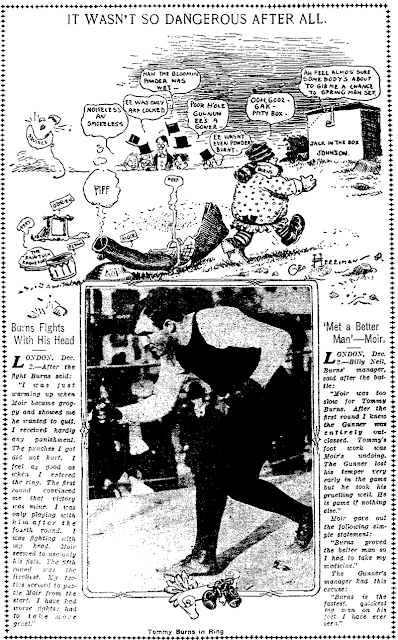 Tuesday, December 3 1907 -- Herriman has to eat a little crow today after predicting that Gunner Moir would prove a formidable opponent for Tommy Burns. Burns dominated the fight and knocked out his opponent in the 10th round. Seems we seldom cover topper strips here as obscurities, not sure why I don't mine that rich vein more often. Anyhow, here's The Family Foursome, the original topper strip to Blondie. 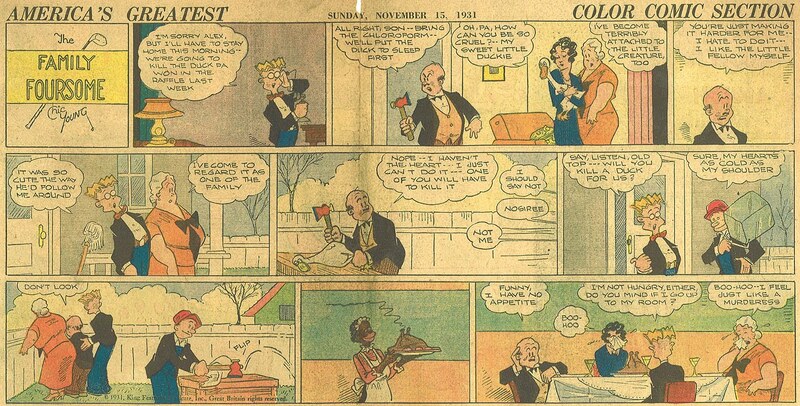 It started with the new Blondie Sunday strip on September 21 1930, began running in tandem with new topper Colonel Potterby and the Duchess in early 1935 and gave way entirely to the new topper after its final episode on April 21 1935. Not sure why Murat "Chic" Young elected to do a strip about golf for his topper but this one was about a links-mad family. 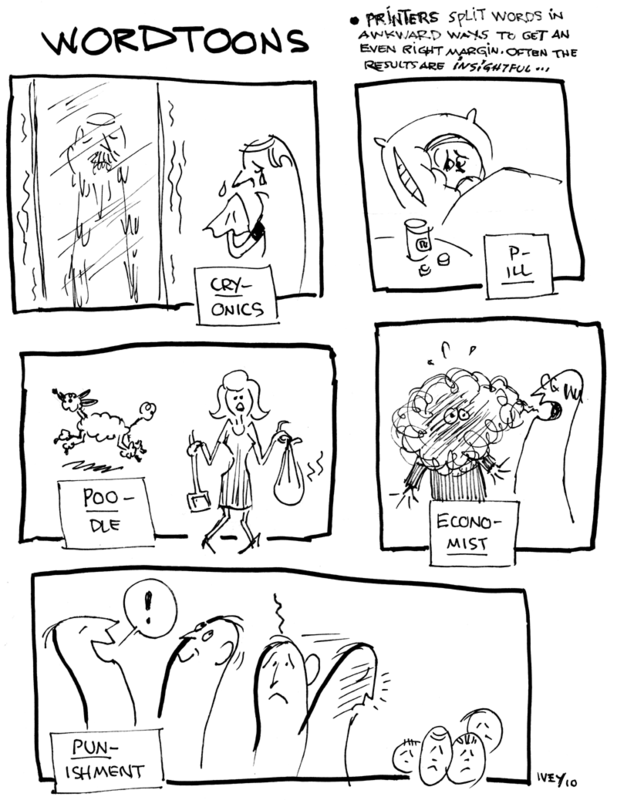 The example above, provided by Steven Stwalley (thanks Steve!) doesn't show the golfing angle, but how about that decapitation scene, eh? Can't believe that wasn't done 'off-stage'! Some syndicate editor was sleeping on the job the day that crossed his desk. 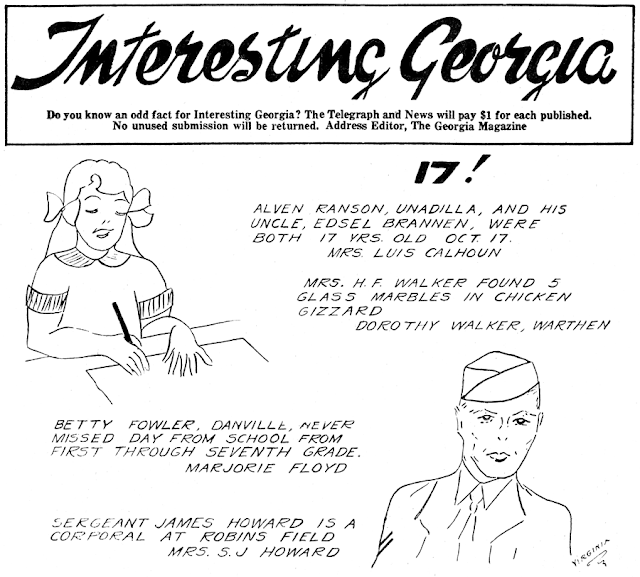 It is probable that Alex Raymond did some ghosting or at least assisting work on the topper, though I see no really solid evidence of it on this example. I'm also told by Alberto Becattini that the venerable Bud Counihan also did assisting on the Sundays during this period (that iceman looks sort of Counihan-ish to me). I should take this opportunity to mention some pretty exciting Blondie news ... well, exciting to historians anyway. The 'official' starting date of the Blondie strip has long been cited as September 8 1930, but after trying to verify that date for many years and coming up empty, I have contended that September 15, the start date found in several papers, was more likely to be correct. However, when IDW and Dean Mullaney decided to do a reprint book of Blondie that began from the start he delved further into the question and finally found paydirt in, of all places, the Wisconsin News, where the strip did indeed begin on 9/8. Congratulations on that important find Dean! Unfortunately now that casts doubt on my Sunday start date of 9/21. It would seem more likely that the first Sunday, then, was on 9/14. Has anyone seen that Sunday? Charles M. Payne was one of the most prolific cartoonists of early newspaper comics, so it surprised me to find that I haven't covered any of his work yet here on the blog. 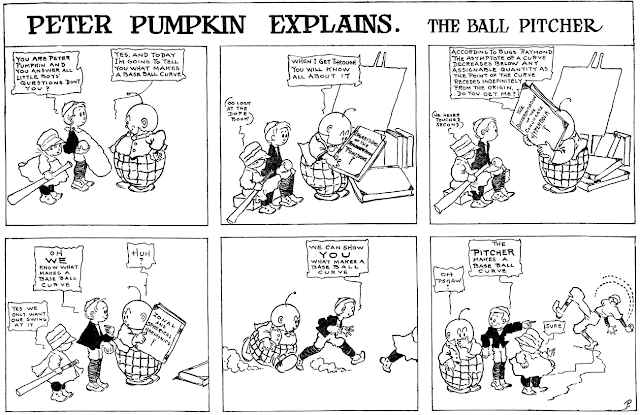 Let's correct that omission now with a short-lived entry that he penned for the Philadelphia Inquirer, Peter Pumpkin. In the 1900s and early teens Payne worked mostly for the Inquirer and the New York World; later he worked for King and then Bell Syndicate. His main claim to fame is his series S'Matter, Pop, which ran from 1911-1940. 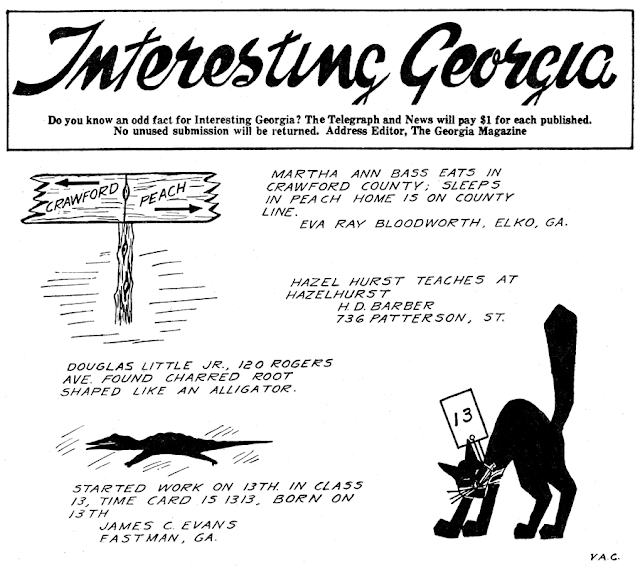 Payne was able to out-produce his fellow cartoonists by the simple expedient of omitting backgrounds from his panels. His characters usually floated in mid-air and props were kept to a bare minimum. His breezy, sketchy style was both fast to draw and eye-catching in the days when cross-hatching and fussy art were the norm. Peter Pumpkin, a pleasant enough series in which a globe-headed smart kid gets bested by the common sense of his companions, ran from July 16 to November 5 1911. Payne's later life is a rather tragic story, but it will have to wait for some other post, or a helpful commenter, since I've run out of time today -- got to go do real life stuff! Cartoonist Russell Myers hit a huge home run in 1970 when he created Broom-Hilda, a very funny and rather surrealistic strip about a witch, a troll and a vulture. In the 80s, though, the strip seemed to sputter a bit, degrading from a mega-hit into a mere success. Myers reacted by offering a second strip through his syndicate, Tribune Media Services, called Perky and Beanz. The new strip was much more down to earth than Broom-Hilda. It starred a precocious 8-year old girl who comes to live with her grandpa, Alphonse G. Beanz, a cantankerous retiree. Co-starring was a depressed dog, Yoyo and an assortment of neighborhood oddballs. The humor was of the tried-and-true clash of generations variety. It was a pleasant enough strip, I suppose, but the problem I see is a mistake that seems to crop up on the comics pages over and over. Myers, who was pushing 50 when the strip was introduced, substitutes lame pop culture references for any real insight into the generation gap. In one week alone, for instance, there are gags about Motley Crue, the Garfield comic strip, Doctor Ruth and Calvin Klein jeans. There's no actual wit involved, as if the references themselves are somehow intrinsically funny. They aren't, and they smell of desperation. Yet the week of strips I'm referring to isn't from well into the run on an off week for Myers, these are in the second week of the strip's run! The Myers name was enough to sell a few newspaper editors on the strip but not many. The Sunday and daily strip began on September 23 1985 and wore out its welcome in most papers pretty quickly. Myers' home paper, the Chicago Tribune, in an unusual instance of showing solidarity with one of their creators, ran the strip for its full two year run, ending September 6 1987. This strip ran for a few months in the BOSTON GLOBE. I remember in the first strips that the GLOBE ran, Beans was VERY cantakerous, as you said, bur near the end of the strip's run, Myers drastically altered the BEANZ character, slimming him down, changing his face (smaller nose and eyes, less jowly) and softening his dispostion. I was wondering if he did that because he was coming off as TOO abrasive to the readers/attempt to salvage the strip. Thanks for bringing up that point Chris. I meant to mention that and forgot. 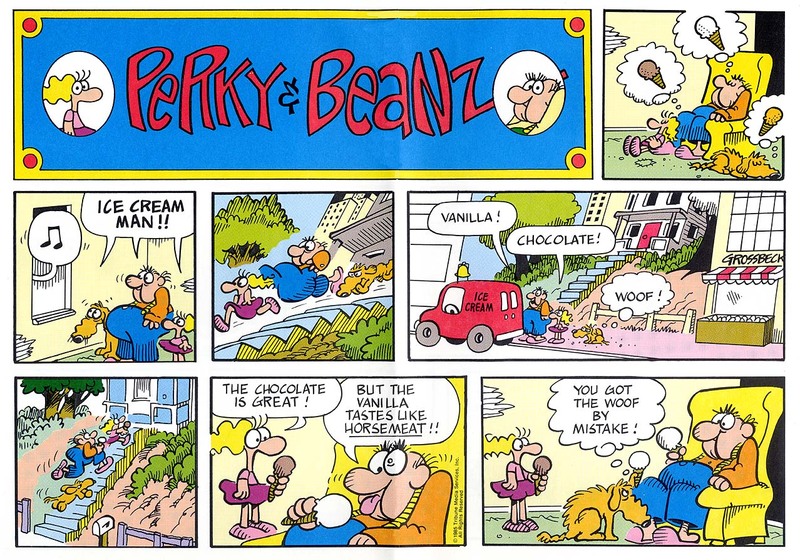 Beanz did get a makeover in June 1986, a very abrupt one in which he was changed just as you describe. This sort of Hail Mary pass isn't uncommon in foundering features, but how making Grampa even LESS interesting as a character was supposed to reverse the fortunes of the strip is a mystery to me. Many newspapers have tried out the idea of a local 'oddities' cartoon, but Interesting Georgia, found by Cole Johnson in late 1943 Sunday issues of the Macon Telegraph, are in his assessment, "maybe the most feeble of them all." I have to go along with Cole on this one. 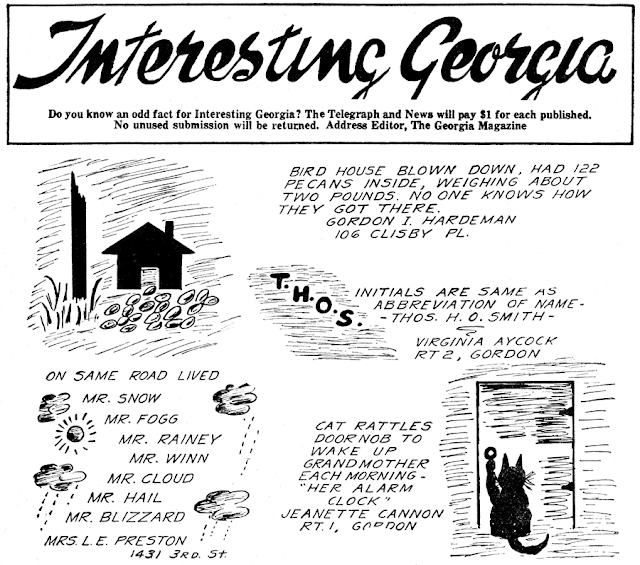 The feature was drawn by someone going by the name Virginia A.C. (one wonders if it is Virginia Aycock, contributor of one item), who illustrated unfathomable mysteries such as a cache of pecans found in a birdhouse, with something less than top-flight penwork. But hey, there was a war on and Virginia undoubtedly felt this was a boost for the morale of Telegraph readers. Our brave boys overseas are pining for news of oddly shaped sweet potatoes and Virginia was dead set on providing them with important tuber updates. 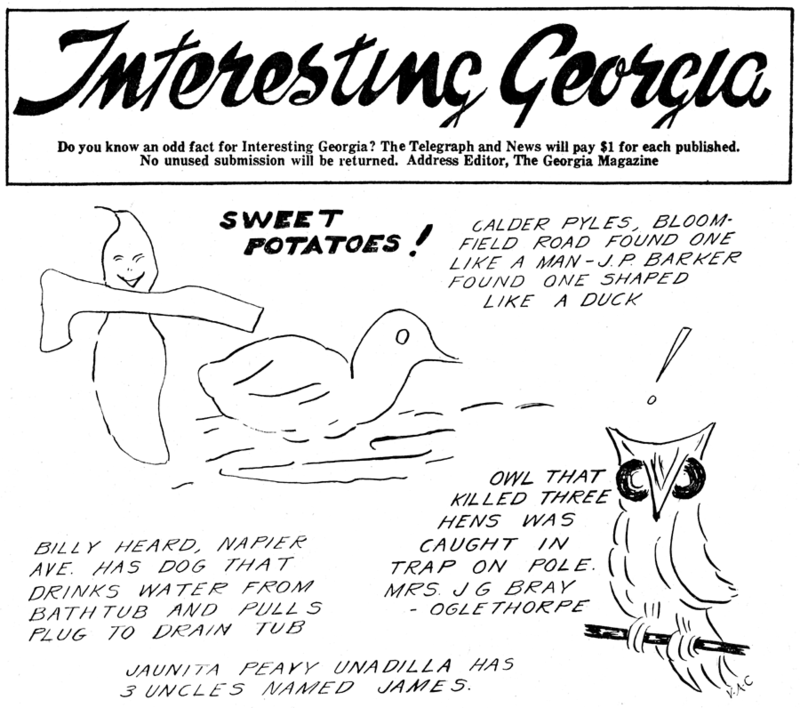 The examples above, all from October-December 1943, are the only ones we know about at this time, but the feature could have, for all we know, run for years ... but don't bet your anthropomorphic taters on it. I'm really enjoying these. Another helping, please?